The eve of the 2016 election in November, while still on exchange in Paris and away from Berlin, I decide not to go to the viewing party that was set up by Sciences Po. Rather, I will stay in my roomy eleven square meter studio and wait for Hillary Clinton’s inevitable win with my Swedish friend. She, who normally studies in Glasgow, didn’t stay up late for the Brexit vote earlier that year in June, assuming like many of us that the sun would rise and the country would have voted to remain. As the November night unfolds and the results roll in, we get ahead of ourselves and figure it’s safe to take a little nap around 1am (Paris Time). The nap lasts longer than planned and we awake around four-thirty. Bleary-eyed, I walk over to the kitchen area of the apartment, a feat accomplished in two small, sleepy steps, and offer to make coffee. Happy only that I chose not to go to the aforementioned viewing party, I Skype three friends at once — in Boston, Annandale-on-Hudson, and Berlin. The five of us try to calm each other down, but this only serves to exacerbate the hysteria. We shouldn’t need calming down. This shouldn’t have happened. My friend leaves the apartment after a few hours to go to the Sciences Po main building on Rue Saint-Guillaume where she finds weeping students scattered in various little nooks and crannies. I, feeling queasy, am unable to eat a full meal until the next day. I share in the collective shock. Naomi Klein’s recently published book, No is Not Enough (2017), sets out first and foremost to tackle this very feeling of shock. Klein, who normally takes several years compiling information for her books, rushed to get No is Not Enough out in just a few months, given the need she felt was present for a work of this kind. The book itself begins with her reflections of that memorable post-election day. She, abroad, just as my friends and I found ourselves, was in Australia for a conference at the time and therefore heard the news around mid-morning. Shock was setting in, maybe not for the Trump supporters, but for a large portion of Americans who weren’t on the bandwagon and for people in countries all over the world who looked on in horror. (I suspect some people who voted for Trump were also surprised, considering that all the predictions gave them little to no chance of victory.) While understandable, shock is a problem. Collective shock makes populations vulnerable, Klein argues, and, for that reason, one needs to become informed fast. Vulnerable in the sense that, when one is shocked, one can’t act against legislation and political actions that one might normally oppose, such as the privatization of public resources. Klein is perhaps best known for her work with climate activism, advocating for the past years “to get the left more involved with climate.”[*1] Her work includes the best-selling book This Changes Everything: Capitalism vs. the Climate (2011), and the documentary that followed. Through both of these, she argues that timid green politics will not be enough to draw us back from the brink of global climate catastrophe: They must be coupled with socialist economics rather than the profit motive. Taking this standpoint and pairing it with her understanding of how shock can function as a method of pushing through unsavory economic reforms that she explained in The Shock Doctrine (2007), now she tackles Trump’s new administration and band of people that she fondly refers to as “disaster capitalists.” For examples of shock or “exceptional circumstances,” Klein gives many. There is the situation in France where, in the wake of the 2015 attacks, a state of emergency has been called that, notably, limits certain freedoms of assembly and has been prolonged many times and still lasts today in a country with a substantial history of disruptive protest and strike-action; President Macron’s new government just recently approved the sixth extinction of the state of emergency which will last up until November 1, 2017. [*2] With regards to pushing forward brutal privatization following a shock, Klein points to the economic reforms after the (CIA-supported) coup which put Pinochet in power in Chile, as well as the wave of privatization witnessed in the United States following the devastation and shock in the wake of Hurricane Katrina. That is only to pluck a few examples from her extensive synthesis. 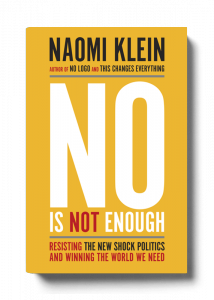 In No is Not Enough, chapter by chapter, Klein goes through and looks at the major “talking points,” as they are now called, in the news, as well as the biggest debates following the election. In the first chapter, she looks at the creation of the Trump brand and how the results of this election could be related to the narrative of modern branding culture. This extends from the leasing of the “Trump” name for building developments all around the world to the creation of a TV personality through Celebrity Apprentice; Klein’s assessment of the show as televised class warfare is a particularly funny—although dark—section of her analysis. Also, this strikes me as perhaps one of the more original narratives she puts forward to explain the the rise of Trump — not just as a man, but as a brand in a century where brands play such a powerful role in the everyday lives of citizens. Sharing Chomsky’s perspective, Klein combines her analysis on this issue with personal notes, such as Klein’s thoughts after visiting a coral reef bleaching—a process by which rising ocean temperatures disrupts reef ecosystems—with her daughter. Anecdotal illustration is crucial to remind the reader of the tangible reality of global warming and the fact that climate policy affects everyday life for everyone. There have been so many shocks since that inauguration. It seems like I can’t go a day without a New York Times notification informing me of something new and disturbing about this administration. No is Not Enough is a good aid in piecing everything together into a coherent narrative and then thinking about what that yes might look like. I’ve left a copy in the BCB library.